If you're experiencing no mobile internet connection problem using Smart Prepaid, Postpaid and SmartBro, please be informed that they are having maintenance activity on their network. You can report your concern by calling their hotline using your phone by dialling *888 or via landline number (02)888-1111 works on (Smart Postpaid, Smart Prepaid, Talk ’N Text) subscribers. The previous week, some users reported having problem on call and text promo services and was acknowledged that they are having system upgrade. 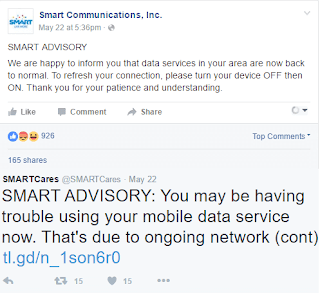 "SMART ADVISORY: You may be having trouble using your mobile data service now. That's due to ongoing network maintenance work that is taking longer than expected. We are working to normalize service soonest. Our sincere apologies for this. Thank you for your patience and consideration." 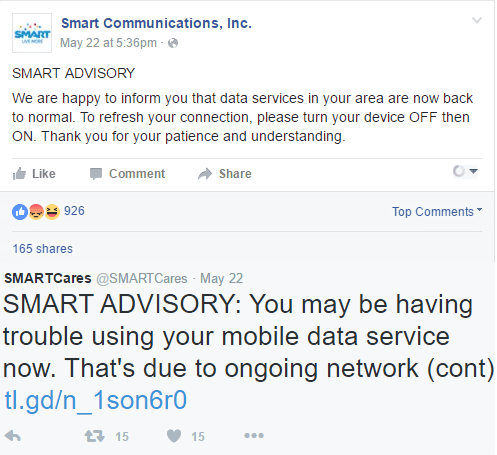 Please stay updated with this issue by following Smart Communications social media pages. You can initiate simple troubleshooting tips below to check if services are already restored back to normal while waiting for their advisory. With this issue you will notice that your data transmission (arrow up and down) or signal status icon (H+, 3G, HSPA, G, E, 4G, LTE) will not appear as there’s not data activity on your phone due to Smart network maintenance.